My foot, covered in green mud-turned-to-slime, slipped on the wall, the rest of me scooting precipitously close to the edge of the chic bench in my private spa “Kabine”. I tried pushing off from the opposing wall, but my hands were as slippery as my feet. Flat on my back and unable to right myself, I calculated I had been in the little room for fifteen minutes or so, watching from my perch as steam hissed from a jet near the door. This was not exactly the stylish getaway to Lenzerheide I had envisioned. Steadied by outstretched feet and hands, I pondered my options. Simply sitting up was not among them. 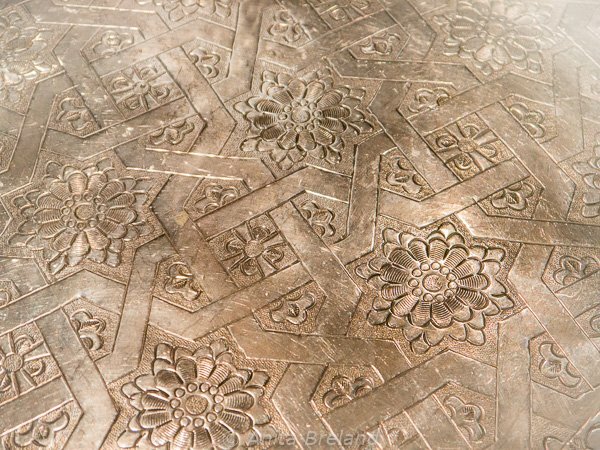 Nor, it seemed, was the likelihood of turning on my side, without pouring myself over the lip of the bench onto the wet, tiled floor. The moment of panic soon passed, though, as the mud at the source of my predicament continued to melt in the steam. By the time the steam jet stopped, I was able to rise from my bench and step under a pleasant tropical rain shower. After the shower, my skin–from head to recently-slippery toes–was as silky soft as promised. I had just completed my first Rhasoul treatment, an add-on to the popular Hammam ritual at Hotel Schweizerhof Lenzerheide’s “wellness oasis”. It was time for a cup of tea, dried fruit and Turkish delight in the quiet of the Camekan quiet zone. Now this was stylish! 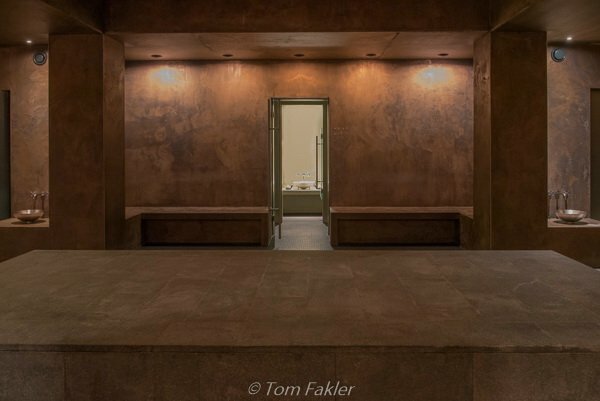 The largest Hammam in the Alps features a tour through various steam rooms and a rest on a warming stone platform. 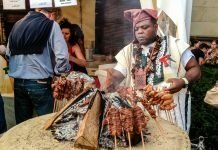 I followed this ritual with a Rhasoul treatment–peeling “mud” and steaming in a private cabin. In addition to themed treatments such as Rhashoul, the Hotel Schweizerhof spa in Lenzerheide offers saunas, indoor and outdoor pools, and a variety of activities–from pilates to zumba. 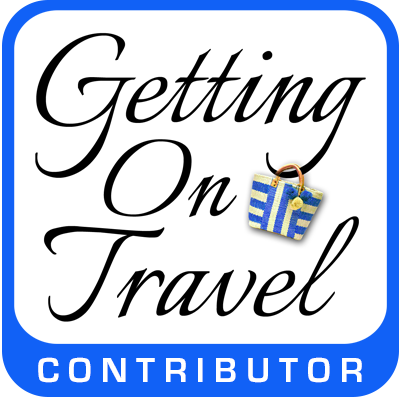 Various accommodation packages, including a new anti-aging treatment, are also available. In 2015, the Schweizerhof celebrates 111 years in operation, and 25 years under the direction of owners Andreas and Claudia Züllig-Landolt. The hotel has been greatly expanded over its first century, and nowadays, contemporary design provides the background for a nostalgic–sometimes humorous–look back at the valley’s earlier self. This family-friendly hotel has earned high marks as a design and lifestyle hotel, and a wellness, and now culinary, destination. As long ago as the 1930s, travelers to Lenzerheide could enjoy gourmet picnics, accompanied by chefs in toques! Our Alpenchic room was large, with an inviting sofa, comfy throws and a choice of CDs. A box of herbal teas and a well-stocked mini-bar made it easy to kick back in style. 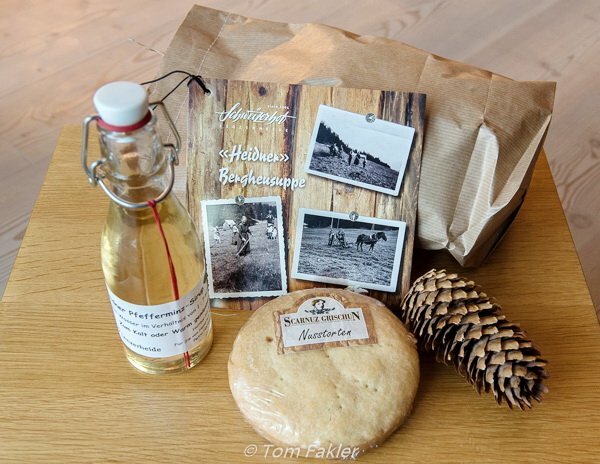 Ingredients and a recipe for the local hay flower soup, a bottle of peppermint syrup and a little Graubunden nut torte were great souvenirs of our stay. Lenzerheide has been a popular year-round destination for more than a century, and is blessed with a long winter season. The Hotel Schweizerhof is a comfortable, centrally located base for enjoying the region’s extensive range of outdoor activities. Fancy skating or curling? The sunny ice rink just behind the hotel offers both. 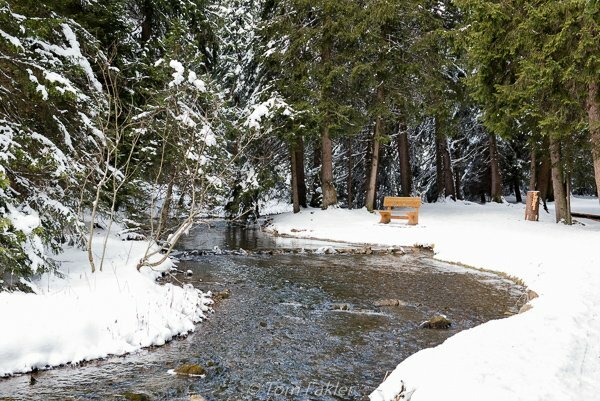 Winter walking here can be as laid-back or as challenging as you wish. A path from the center of town meanders through a forest and beside a stream to nearby Heidesee. Not far away, seven marked winter walking/hiking trails and four snowshoe trails present a variety of levels of difficulty from easy (flat!) to seriously uphill. The ski region of Lenzerheide includes the nearby resorts of Parpan and Valbella and is a Langlauf (cross-country skiing) paradise, offering 56 kilometers of ski trails at all levels. The Arosa Lenzerheide ski region offers 225 prepared pistes up to 2,865 meters above sea level. 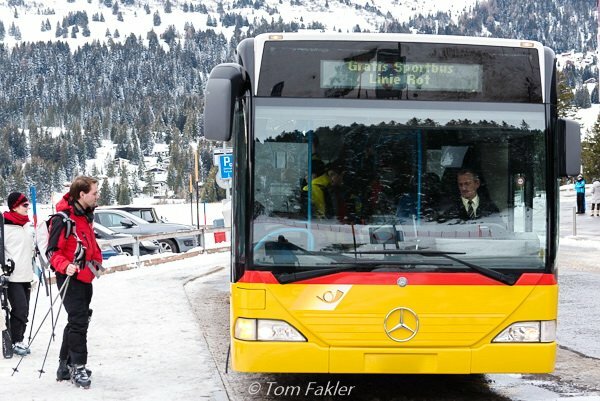 Ski tickets are also tickets for public transport in the corridor connecting Lenzerheide and Tiefencastel with Arosa. 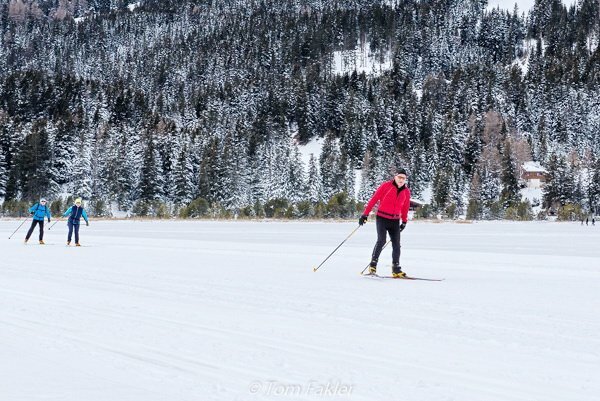 The Lenzerheide Sportbus is free, and makes trying a variety of ski and hiking venues a snap. 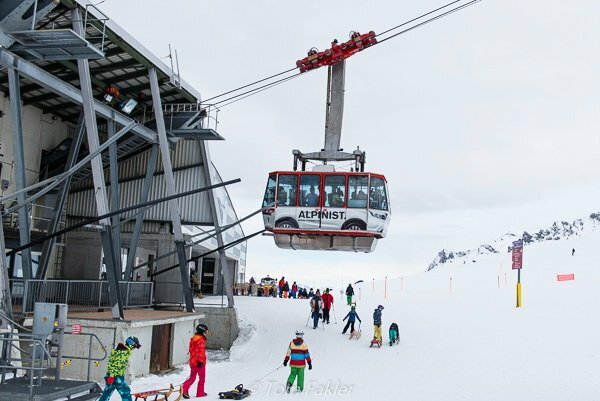 Mountain lifts via gondola and chairlift link Lenzerheide with the large Arosa ski arena. 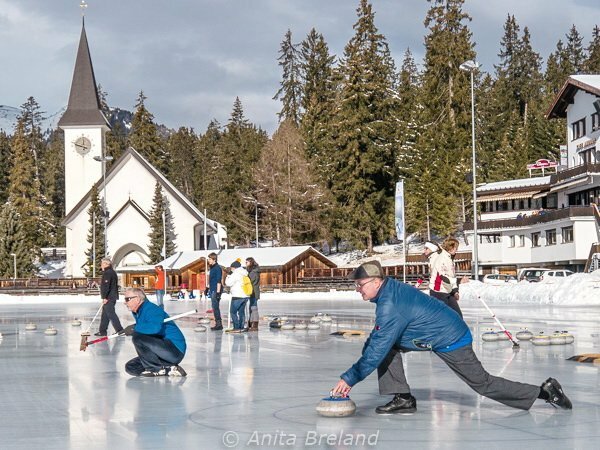 For details on winter sports activities in the area, visit the Lenzerheide tourism website. Five restaurants in the Schweizerhof feature locally sourced ingredients and offer a range of dining venues. Menus in the hotel’s restaurants feature regional dishes as well as a range of Mediterranean options, and cater for vegetarians and vegans. 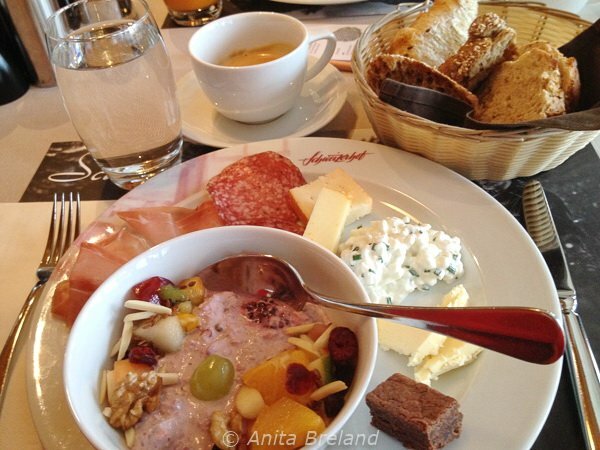 Hotel Schweizerhof puts on a copious breakfast buffet, with many healthy options, and eggs and waffles cooked to order. Two new restaurants–Scalottas Carn & Caschiel (fondues and steaks) and Scalottas Terroir (a local kitchen with regional products)–have opened over the past year, and we enjoyed great meals in both of them. 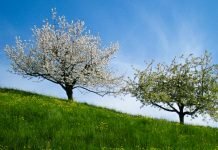 Each is highly recommended for its unique atmosphere, innovative menu and great flavors. Located just 150 meters along the Voa Principala in Lenzerheide, the Scalottas restaurants are convenient dinner destinations, whether or not you are a guest at the Schweizerhof! Lenzerheide is a scenic 20-minute ride with PostBus Switzerland down the valley from Chur’s main railway station, through Parpan and Valbella. During peak winter season, December into April, the free Lenzerheide Sports Bus circles the valley, bringing you to the Rothornbahn gondolas and several chairlifts on both sides of the valley. Hotel Schweizerhof Lenzerheide offers a location, comfort and a wonderful Graubunden dining sampler. 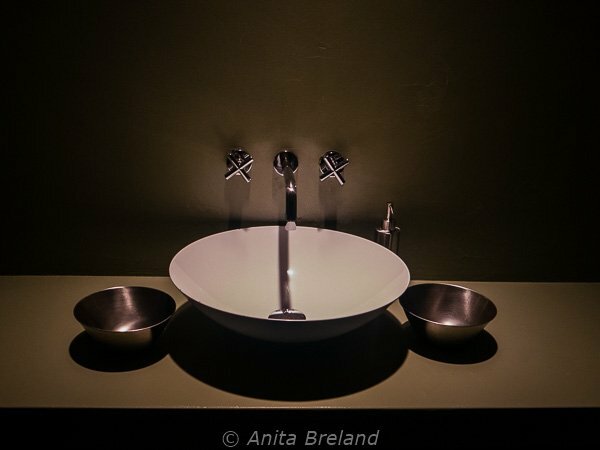 My somewhat undignified introduction to Rhashoul notwithstanding, a weekend stay at the Hotel Schweizerhof Lenzerheide can make for a stylish getaway indeed! Travel with the wonderful Swiss Travel System. It’s possible to bring a car, but there is really no need. The Schweizerhof rewards travelers who arrive via public transport with a voucher for sledding, or a sweet Graubunden welcome pack. Sample the menus at Scalottas Carn & Caschiel (fondues and steaks) and Terroir (a local kitchen with regional products). In either restaurant, the experience is atmospheric, and promises a treat for your taste buds! 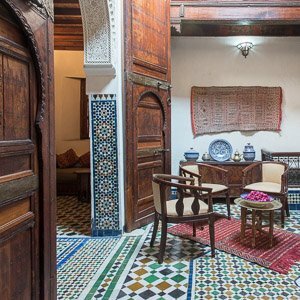 Spend an hour in the Hammam, and top it off with a Rhasoul treatment. This is especially comforting as a couples activity, or with a friend, to help each other with a back rub. Finish with an oil or cream application to emerge with extra silky skin. For a chuckle, visit the Schweizerhof’s “standing cinema”–a one-person movie theater featuring short vintage clips of life in the village and nearby mountains a century ago. 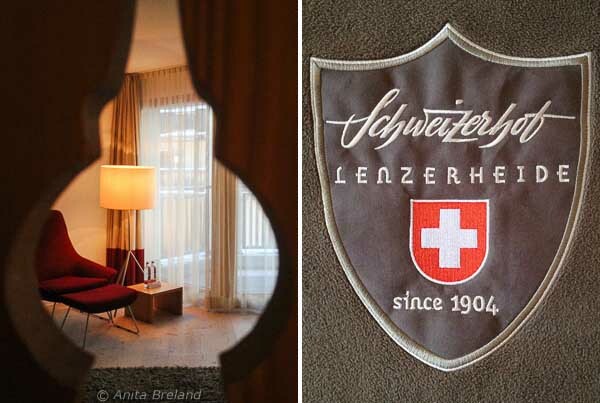 We traveled to Lenzerheide as guests of Switzerland Tourism and the Hotel Schweizerhof Lenzerheide. Many thanks for a wonderful stay! 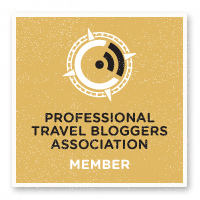 To see all our travel stories from Switzerland, click here. 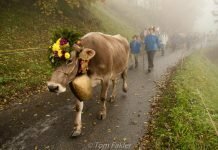 I don’t enjoy the cold winter sports so much any more, but I love Switzerland and would like to try that Hammam and the tantalizing local foods in your image. The souvenirs were also of interest. Thanks for your comment, Carole. Lenzerheide is a great place to just enjoy a winter atmosphere, with or without sporting activities–plenty of cozy options, too! I’ve not yet made the hay flower soup at home, but it was delicious in the Terroir Restaurant.